Wicklow - Staywell® Classic Manual 4-Way Locking Cat Flap - White w/tunnel. The Staywell Manual 4 Way Locking Classic Cat Flap with Tunnel is so easy for your cat to use. This design is suitable for cats up to 7kg and is simple to install featuring a tunnel that can be cut depending on the width of your door. (Wicklow - Staywell® Deluxe Magnetic Cat Flap - White. 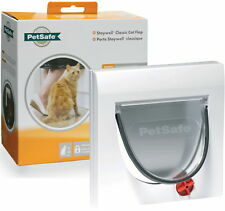 PetSafe Staywell Deluxe Magnetic Cat Flap. Once inside, the flap can no longer be pushed open as the magnetic key is not present. Refer to the User’s Guide for further information. ). Authorised Dealer 3 Year Manufactures Guarantee. PetSafe Staywell Manual 4-Way Locking Classic Cat Flap - With Tunnel 917EF Description Our classic door with locking options. The 4-way lock offers the ultimate in flexibility. Set the door to open, closed, in only or out only. Available in white with or without a tunnel. Features ---For dogs and cats up to 7 kg ---Rigid, transparent plastic flap ---Durable plastic frame ---Fits doors up to 5.7cm thick (with tunnel) or up to 1cm thick (without tunnel) ---Manual 4-Way lock: in only, out only, open and locked Door Sizing Chart Overall Size Cut Out Size Glass Cut Out Size Maximum Pet Shoulder Width 224 mm x 224 mm 169 mm x 169 mm 210 mm diameter 162 mm. Staywell 15 Staywell 16 - Staywell 17 - Staywell 18 - Staywell 19 - Staywell 20 - Staywell 21 - Staywell 22 - Staywell 30 - Staywell 31 - Staywell 32 - Staywell 917 - Staywell 919 - Staywell 932 Staywell - 916 Staywell - 918. For 4-Way Electromagnetic Flap3851 /3869. Compatible with our electromagnetic 4-way cat door (item 3869). Simply attach this lightweight device to your pet's collar. Trixie Magnetic Cat Collar Magnet. Simple slide Open/Closed lock. Self lining to 2" (50mm) thick - ideal for all doors, very thin panels and screens. Thickness : Self lining to 2", (50mm) thick. Master Plastics SW Ltd. Cut Out Size : 6 1/2" x 6 7/8", (165mm x 174mm). ThisPet-Tek Glass Fitting Dog Door in Clear has a professional design and will endure year after year of daily use. Pet-Tek Superior designed dog doors are simple to install, look great and will give you the peace of mind that your pet is secure. STAYWELL 300 CAT FLAP DOOR. The White 4 Way Manual Locking Cat Flap has a universal fitting and can be installed in windows, walls and doors, making it incredibly versatile. Designed with a see-through rigid flap and a total of four individual settings suited to both you and your cat's needs. Cat/Dog Mate 363 - Large Cat/ Small Dog Electromagnetic Flap - White. Part Code : 363. Self lining to 60mm (2) thick. The actual "flap" size your pet needs to get through is 18cms x 19.5cms. Doors/Panel (Self Lining Thickness): 60mm (2"). Cut out is 185mm x 158mm. Overall size is 236mm x 198mm. Wicklow - Staywell® Original 2-Way Pet Door - Small Silver. Your small dog or cat can let himself out with the 2-Way Pet Door. Set it to Unlocked for more freedom or Locked when you don't want your pet to use the door. Simple slide Open/Closed lock. Colour Brown. Master Plastics SW Ltd. Cut Out Size : 6 1/2" x 6 7/8", (165mm x 174mm). 17-11-2017 13:54:33. Self lining to 2" (50mm) thick - ideal for all doors, very thin panels and screens. Closing panel included (slots down behind the flap for when not in use). Maximum pet shoulder width: 147mm (5 3/4”). PETSAFE STAYWELL ORIGINAL TWO WAY SMALL PET DOOR. Cut out sze: 185 mm x 158 mm (7 1/4” x 6 1/4”). 4 Way door for cats, white plastic with silent action due to special jerk absorption and special sealing and magnetic lock. flap size 15.7 × 16 cm. cut out size 18 × 20 cm. (fits The Cat Mate 204 209). These spare doors for the Cat Mate will fit all the standard size two way locking (locked or unlocked) cat doors (not large cat doors) will fit the four way locking but will have to remove one of the buttons and it will then only be locked or unlocked. Petsafe 4 way cat flap, model 917ef. With tunnel. Tunnel can be cut to fit door. Wicklow - Staywell® Aluminium Pet Door - Large White. Easy to maintain, clean and operate, the pet door also includes a closing panel for when it is not in use or you want to keep your pet in. This provides pets with a greater freedom of choice end extends the areas in which they can self-exercise and explore. New Staywell Cat Flap & Small Dog Door Grey 737. Small pet door - Grey - With see through flap. With see through flap. Pet Max shoulder width: 147mm. For cats up to 7kg (15 Ibs) and small dogs. Cut out size: 185mm x 158mm. Cat Flap Adaptor Kit for Walls and Glass Panels The Cat Flap Adaptor Kit for Walls and Glass Panels enables easy installation into walls and glass panels for the Cat Mate Microchip Cat Flap (Ref.360) and Rotary 4 Way Locking Cat Flap (Ref. ). Staywell Cat Door 320 Way Tunnel Woodgrain. 4 Way locking cat flap - WOODGRAIN - With see through rigid flap. Manual 4 way security lock: In Only - Out Only - Opened - Locked. Cut Out Size: 168mm x 175mm (6 1/2" x 6 3/4"). Ferplast 4-Way Manual Cat Flap Swing 5T White 72103011. The Swing 5T 4-way manual cat flap from Ferplast is a pet door devoted exclusively to your four-legged friend. It consists of a flag placed on the bottom of the pet flap, which will face the direction in which your furry friend last went. PetSafe Staywell 4 Way Locking Deluxe Cat Flap Wood Grain - Brown Cat Door 320EF Description Staywell 320 -Brown Deluxe 4 way locking cat flap. The Staywell 320 gives you more control, allowing you to set the cat flap: In only, out only, fully locked, fully unlocked. The flap is a solid translucent flap with magnetic seal. The 320 cat flap comes complete with 1 tunnel extension, hand for lining holes through doors. Additional tunnels are available to line longer tunnels e.g. through walls. Each Staywell 330 Tunnel Extensions adds 1 7/8" and can be clipped together to the required size. (See below). The Staywell 300 basic Cat flap kit is suitable for fitting into doors, walls or glass to a maximum depth of 54mm (2"). PetSafe 400EF Magnetic 4-Way Locking Cat Flap, White No Magnets Included. 4.5 out of 5 stars - PetSafe 400EF Magnetic 4-Way Locking Cat Flap, White No Magnets Included. 15 product ratings15 product ratings - PetSafe 400EF Magnetic 4-Way Locking Cat Flap, White No Magnets Included. PetSafe Dog & Cat Flap Staywell Original 2-Way Pet Door Silver. The door can be manually set to ‘Locked’ or ‘Unlocked’ depending on when you want your pet to be able to use the door. This will give your dog or cat the freedom to get fresh air, exercise and use the toilet if they need. 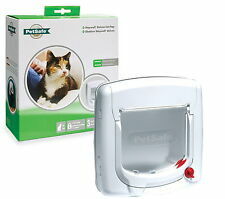 Petsafe Staywell Classic Cat Flap New.